Qatar Airways has announced it is taking an almost Qatar Airways 10% stake in Hong Kong-based Cathay Pacific Airways. The agreement, which Qatar Airways said it expects to complete Nov. 6, means the Gulf carrier will hold a 9.6% stake in Cathay at a value of about $600 million. Cathay and Qatar are both members of the oneworld global alliance. Qatar Airways already has a 20% stake in International Airlines Group, parent of British Airways, another oneworld member, as well as a 10% stake in LATAM Airlines Group, and a 49% investment in Meridiana. Qatar backed off from a move in June to take a 10% stake in American Airlines, also in oneworld, after American chairman and CEO Doug Parker sharply rebuked the bid as puzzling at best; concerning at worst. 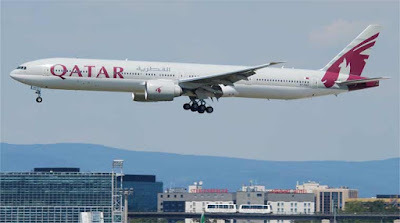 American is campaigning with Delta Air Lines and United Airlines to constrain growth of the major Gulf carriers – Qatar, Emirates Airlines and Etihad Airways – over claims that they are heavily subsidized by their government owners. Qatar Airways Group CEO Akbar Al Baker said in a statement Monday that Cathay was one of the strongest airlines in the world, respected throughout the industry and with massive potential for the future. There was no press statement from Cathay, which in August posted a net loss of HKD2.1 billion ($268.2 million) for the first half of 2017, a reversal from a HKD353 million net profit in the same period last year. Cathay faces increasing competition in many of its markets, particularly from mainland China’s major airlines. Cathay’s major shareholders are Swire Pacific, which holds 35%, and Air China, which holds almost 30%. A Transavia Boeing 737-700 performing flight from Eindhoven to Tel Aviv was near Prague, when the crew decided to return after both autopilots had failed and the aircraft thus had lost its capability to operate in reduced vertical separation minima. The aircraft descended to FL360 for the return and diverted to Amsterdam (Netherlands) for a safe landing on runway 27 about one hour later. A replacement Boeing 737-800 registration PH-HSM departed about 2 hours after landing and reached Tel Aviv with a delay of 3.5 hours. Air China has taken delivery of the airline’s first 737 MAX 8. China’s national flag carrier is the first airline in the country to receive the 737 MAX. Customers throughout China will take delivery of nearly 100 737 MAXs by the end of next year. Boeing’s partnership with Air China dates back to the 1970s. Air China’s fleet includes seven Boeing 747-8s, 26 777-300ERs, 11 787-9 Dreamliners and more than 140 Next-Generation 737s. WestJet announced it has been recognized as Best Low-Cost Airline – The Americas for 2018 by airlineratings.com. The website rates more than 425 airlines around the globe to determine its award winners. It is an honour to be named Best Low-Cost Airline for the whole of North and South America, said Ed Sims, WestJet Executive Vice-President, Commercial. This is a reflection of the hard work and caring nature of our more than 13,000 WestJetters. The timing on this award is welcome as we begin to build our international reputation in preparation for the arrival of our Boeing 787-9 Dreamliners in 2019. WestJet was selected on its innovation of bringing affordable and safe travel to millions across North America, said AirlineRatings.com Editor-in-Chief Geoffrey Thomas. In addition, WestJet’s employees have brought back the magic of flying to its guests. President Nana Addo Dankwa Akufo-Addo who disclosed this recently while declaring open, the African Airshow in Accra, Ghana said he was enthused about the development. He called on Ghanaians, both home and abroad, to take advantage of the prevailing friendly environment and invest in the rapidly growing aviation sector, adding that the government had successfully created the right conditions for the private sector to thrive in the industry in order to propel growth and create employment, especially for the youth.